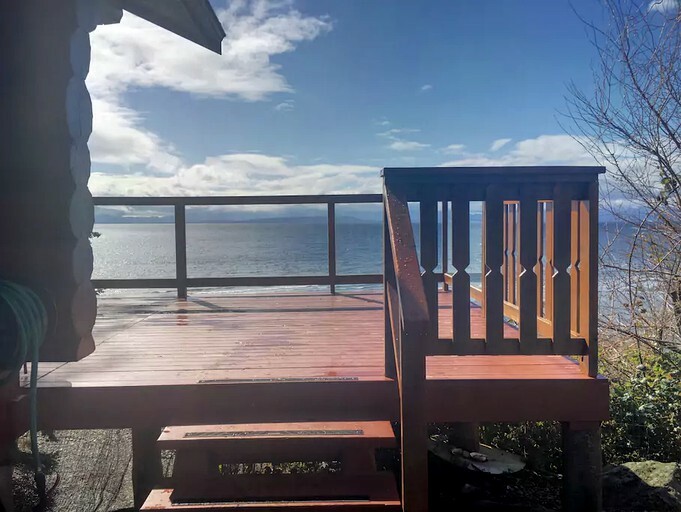 This family-friendly cottage rental is located on Texada Island, British Columbia, and can accommodate up to six guests. There are three attractive bedrooms and one full bathroom. 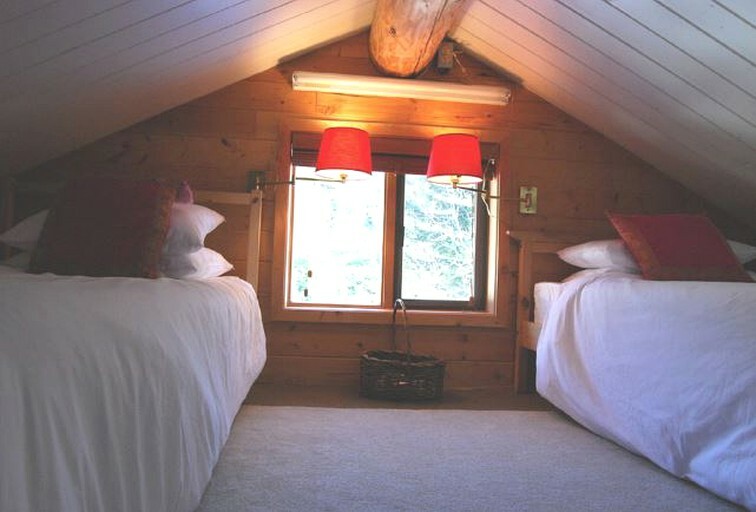 The first bedroom has a king-size bed, the second bedroom has a double bed, and the loft bedroom features two single beds. Further sleeping space comes in the form of a double sofa bed, in the lounge area. 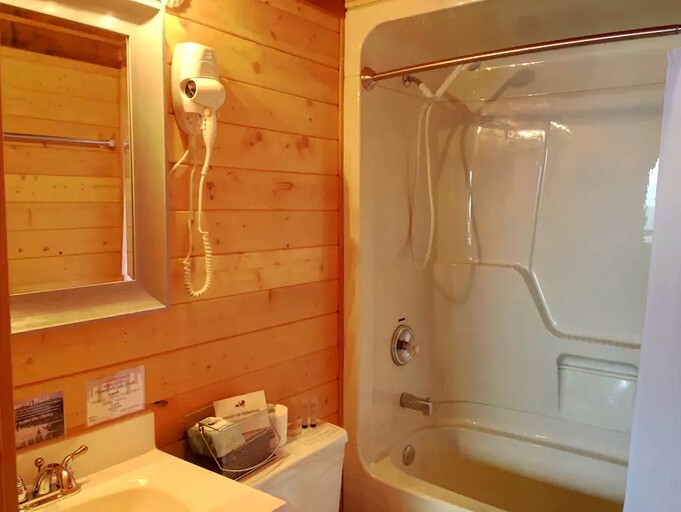 In the bright and modern bathroom, guests will find a toilet, a sink, and a shower and bathtub combination. Luxury linens and freshly-laundered towels are provided by the host. In the cozy and welcoming living room, glampers will find plenty of comfy sofa space, along with a flat screen television and a DVD player, for enjoying family movie nights. There is also a stereo, for playing music, and a selection of games for guests’ entertainment. 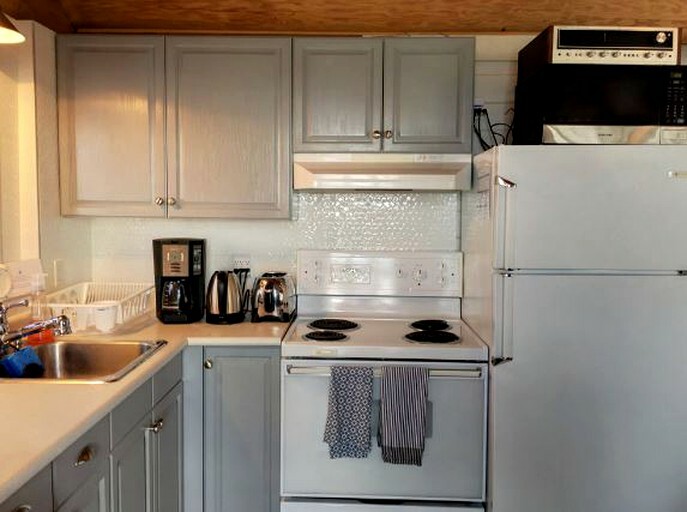 The fully-equipped kitchen comes with a refrigerator, a freezer, an oven, a stove, a microwave, a coffeemaker, and a toaster. There is also an array of dishes and utensils, and a variety of pantry items, such as oil, salt, sugar, spices, coffee, and tea. Meals and drinks can be enjoyed at the dining table, which has seating for six people, and beautiful ocean views. 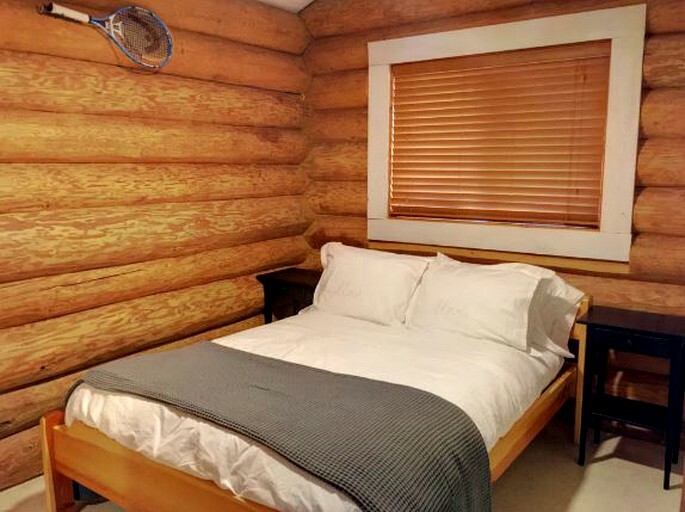 Other amenities in the property include Wi-Fi access, laundry facilities, heating, and a hairdryer. There are some superb facilities on offer here. Those traveling by car will find plenty of free parking on the premises, including space for boats, trailers, and SUVs. 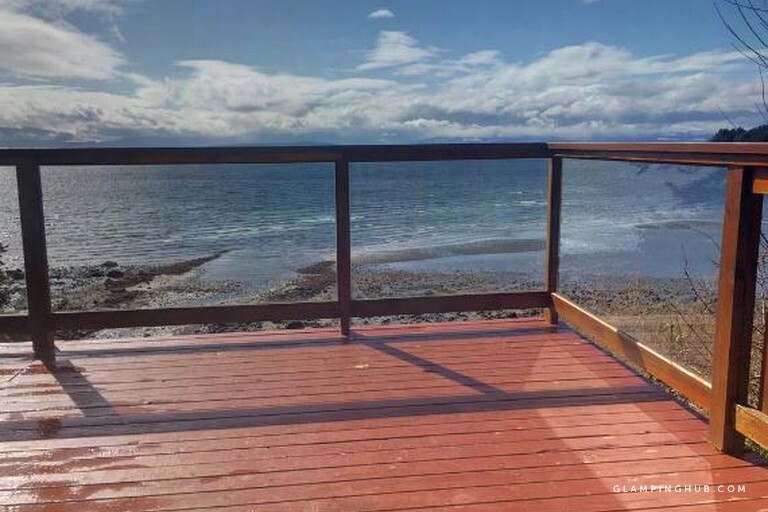 Outside, guests have a large private decking area with patio furniture and gorgeous views, and there is direct access from the property to the sandy beach below. 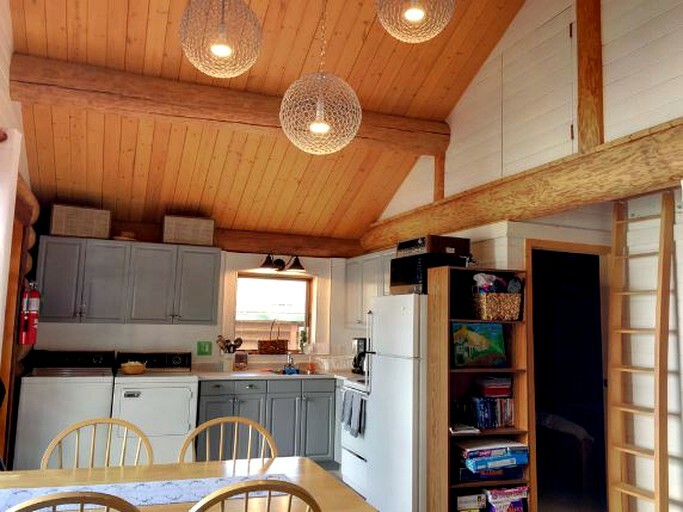 Inside, the cottage is heated throughout, meaning that guests will be cozy during colder weather. 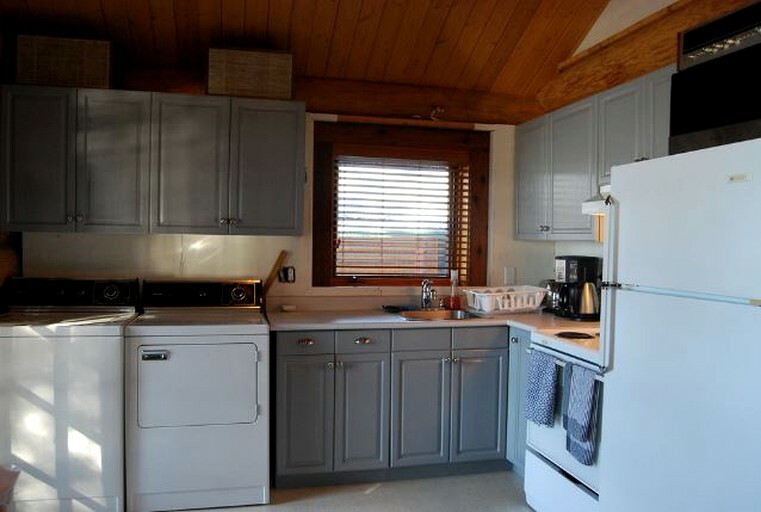 There is also a fully-equipped kitchen for cooking. 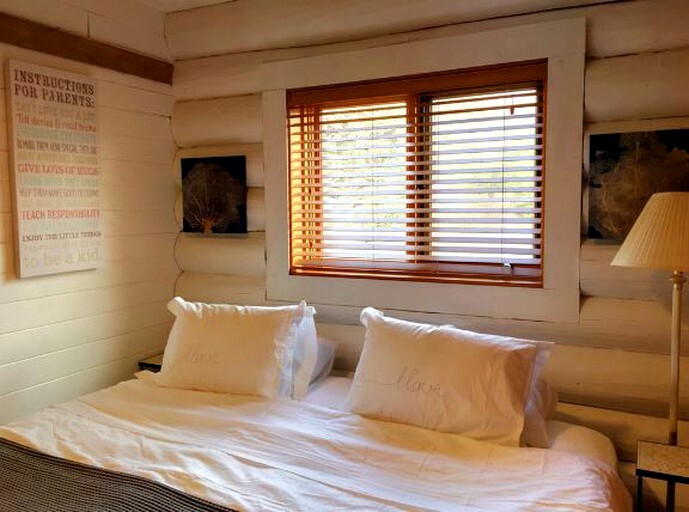 Glampers who need to stay connected can take advantage of the free Wi-Fi on offer. For entertainment, there is a television, a DVD player, a stereo, and a selection of board games. Laundry facilities include a washer and dryer, and an iron and board, and there is a hairdryer available in the cottage for guests to use. Bath towels and 400 thread count Egyptian sateen cotton sheets are provided. For an additional fee, a light housekeeping service can be arranged during the stay. 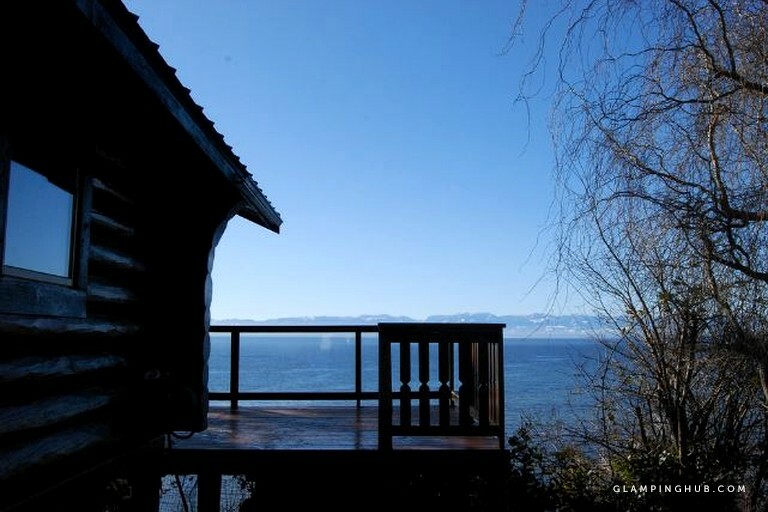 This self-contained 20-year-old log cabin is located on the desirable Gillies Bay waterfront of Texada Island, in British Columbia or BC, Canada, and offers the perfect oceanfront getaway on the beach! 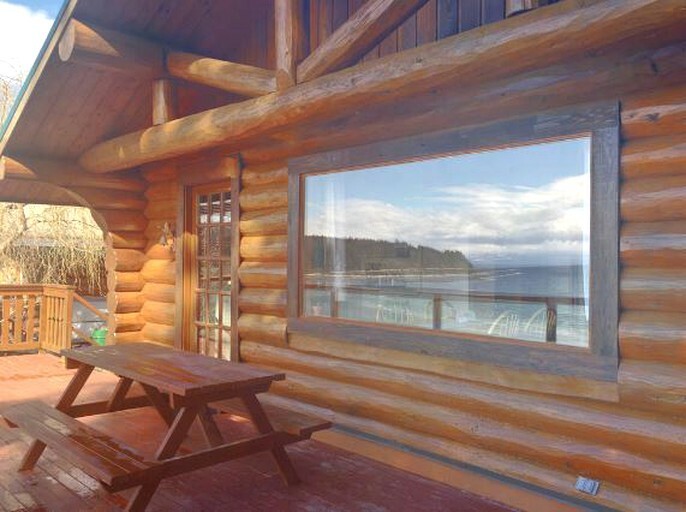 Guests can relax at this spectacular waterfront log cabin, listen to the gentle waves, play on the beach, and guests can spot wildlife before their eyes. Glampers will be just a few steps from a delightful sandy beach and can spot a variety of wildlife, right on their doorstep. 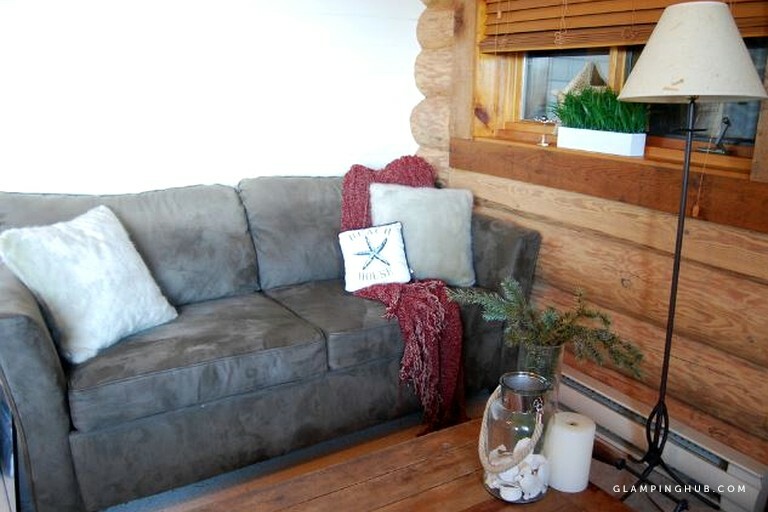 With a contemporary feel, this cabin is a cozy retreat for a couple or family to rejuvenate and catch up. Guests can create memories on a family vacation and escape from the city. This retreat is ideal for couples, families, those seeking inspiration, business travelers, and outdoor enthusiasts! It is the perfect spot for summer sunsets and winter storm watching. Within close walking distance, there are handy amenities, such as a grocery store, a restaurant, a market, and medical services. 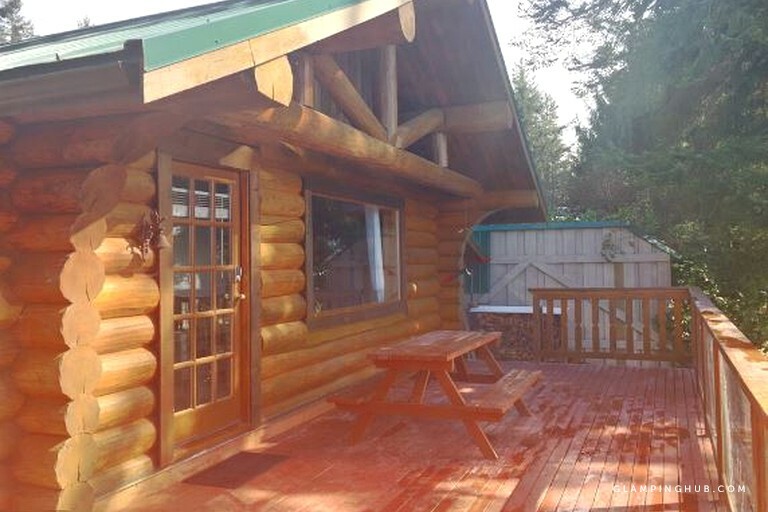 The property is also close to fun local attractions and activities, including nature trails and regional parks. 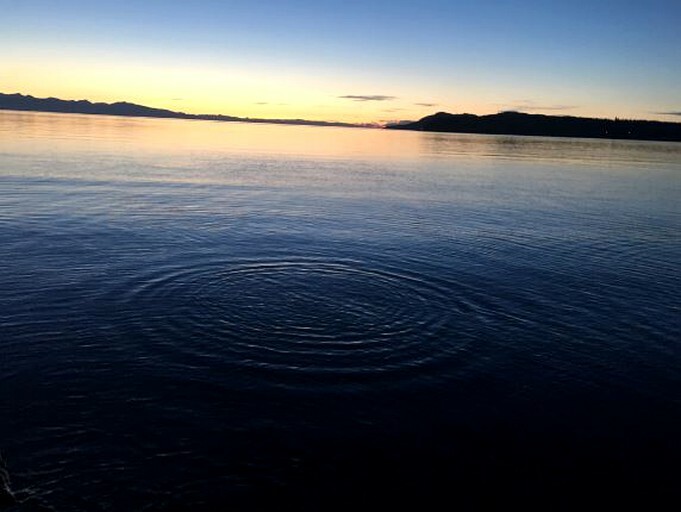 In just over an hour, by car and ferry, guests can arrive in the larger city of Powell River, which offers a wider selection of services. 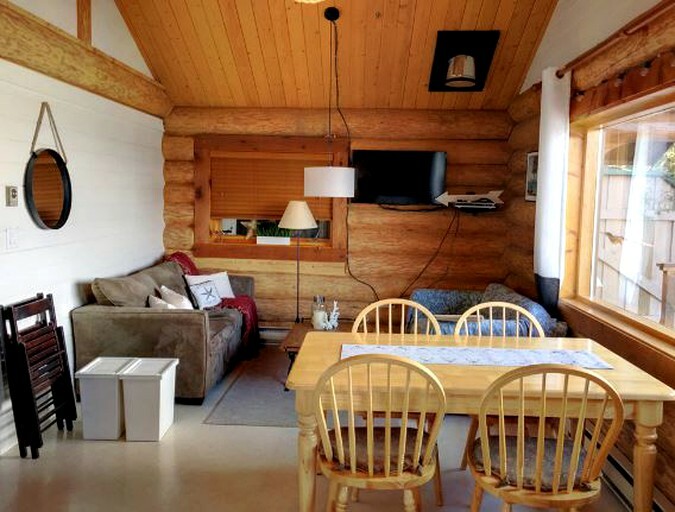 The cabin is a five to seven-minute walk to a grocery store, a restaurant, the farmers market, community hall, a library, a clinic and tennis courts. 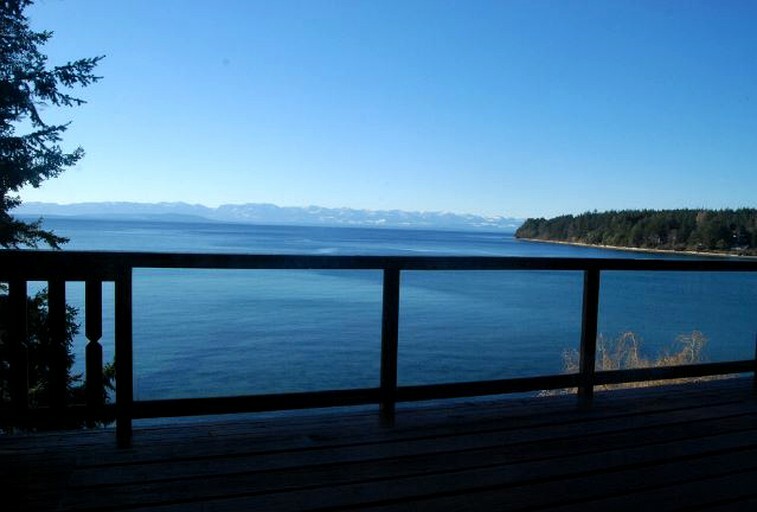 It is close to hiking trails, a nine-hole golf course, boat access, the airport, and a ferry. 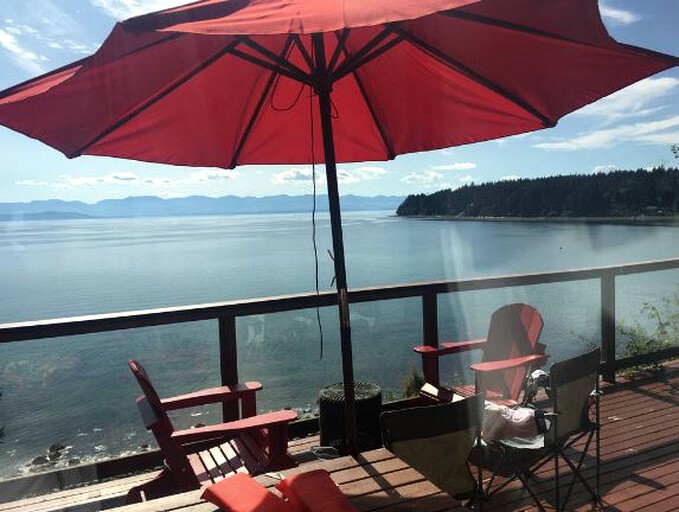 At this retreat, guests can experience island life and the beach cottage lifestyle! Guests should bring their own car or bike, as there is no public transit on the island. There are endless opportunities for fun in this fantastic region. The property's waterfront location make this the ideal place for water sports, such as swimming, scuba diving, boating, kayaking, and paddle-boarding. There are places close to the property from which glampers can rent equipment. Freshwater and saltwater fishing is a popular local pastime, and keen anglers can hope to reel in brown trout, salmon, rockfish and more. 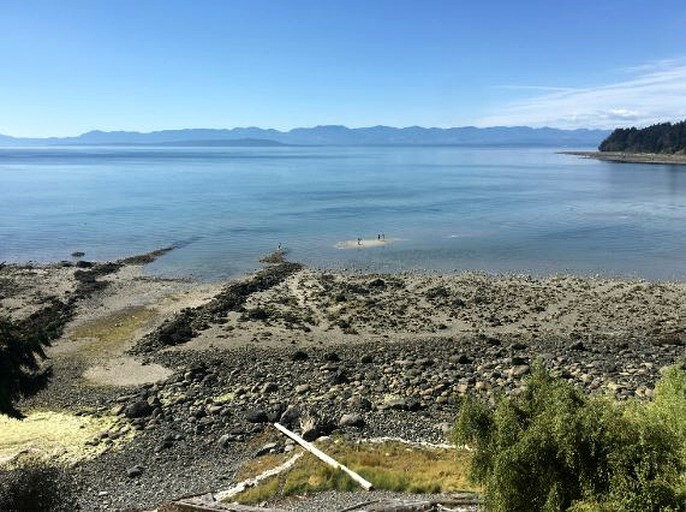 Nature lovers will be in their element here, as the island is teeming with wildlife, and they'll have the chance to spot herons, eagles, deer, seals, dolphins, and even whales. There are many hiking and biking trails close to the property, with something to suit most levels and abilities, for those who want to combine wildlife viewing with some energizing exercise. On the island's sandy beaches, guests will be able to enjoy relaxing, beachcombing, picnicking, and clam digging. From the beach in front of the property, it's possible to dig up unusual Pacific geoduck clams, which are a large, edible species. A few minutes' walk from the cottage, guests will find a superb weekly farmer's market, which takes place every Sunday in Gillies Bay. Glampers will discover delicious fresh produce for sale, as well as unique local arts and crafts. Smoking is not allowed in the accommodation, nor on the outside deck. This is a very quiet neighborhood where parties are not suitable. Parties are not allowed on the premises. Stores close very early as do restaurants.